If you've been following this blog for any period of time you know that I am a huge fan of the tea collection. I'd go so far as to say it may be my favorite. Every tea item I have ever purchased has lasted through multiple washings, wearings, both girls, and the clothes still look as good as the day they were purchased. The knits are high quality, they don't run or tear, they are soft and comfortable, the cottons some of the best I've seen, and I believe the designs speak for themselves. They are unlike any other brand I have come across. They've recently launched their spring line. It's beautiful. Simple designs paired with bold, bright colors and filled with brazilian samba style. Which clothes will you be putting in your cart? My name is Jennifer Moses and I would LOVE to win the Izumi and Mizumoto dress from the East meets Brazil collection. Being of Japanese descent, I love how this collection intertwines my daughter's cultural roots to match both her Japanese and Caucasian features. We would love to be considered to win!! Hello! What a fabulous give-away! I would love to have the Penelope 5-piece set in my cart. It would be the perfect addition to my daughter Lily's spring wardrobe. I would love the Parker 5-piece set for my two boys. I think the girls' clothes are wonderful but my daughter is now too old! Thanks for introducing me to this line. .. I so love the Mizumoto stripe dress but I think my daughter would go for the Santa Teresa (unless it twirls, she normally won't wear it). I love the Daily Tea Polo with the big bug on it. My little guy would love that. Ooooh, would we ever put this gift to good use! I have my eye on everything with the dolphin motif in the daily tea line... or maybe the guitar shirt... or maybe some of those really comfy pants! maybe a mix match of dresses for a portrait, humm?! I love all the dresses. I would stuff as many of those in my cart as I possibly could! Those sets are soo cute! I love the Jamie set...so many days of outfits, all built in! I really love the east meets brazil collection! I LOVE Tea! I just bought one of last season's Daily Tea Wrap Tunics on sale, & it's adorable! I'd love the Santa Theresa dress. Oh, the Rio Dress is so cute! -Kristin R.
I love the East meets Brazil collection! I recently stumbled upon the Tea collection at a local boutique and fell in love with it. I was able to get a few winter things on clearance but would love to win some new spring clothes for the boys! wow, i love their new spring line! i think i would put one of each romper in my basket for my baby girl to play in this summer!! but i have always loved the idea of buying one of their "sets". maybe i finally will! I love their clothes for boys! I like all of the new collections but think I would choose the Early Spring Daily Tea collection. Thanks!! Oh I'm smitten. I always smile at your giveaways and enjoy your blog..but this time..this time I had to enter. I would love the Mizumoto dress..it's gorgeous and so versatile. I'd pair it with so much. I love the Gloria dress too..very color fun. I'd have to pick up a few things from the Global fund. Nothing better than wearing something you feel good about..for the right reasons. Crossing my fingers..
my little boy LOVES guitars, so i would have to go with the brazilian samba line, the little polo with the guitar! so fun. i really want the blue/gray dress at the top of the dresses category, but i can't find it listed. i know i saw it in the catalog, though. i need size 7/8, which they don't carry in my boutique here in town which sells Tea. thanks for the chance! The Tabitha set from the Spring collection is beautiful. It's all beautiful! I would love to win something that I could have both my girls wear that would stand up to being handed down. Wow! I also love the East meets Brazil collection, for both genders, but the Mizumoto stripe dress is a true stand-out. Love the butterfly sleeveless banded dress! And I'd love to see it on my daughter! They have the cutest clothes. I would love to get the Santa Teresa Dress for my daughter. I love Tea clothing too! They have beautiful, cheery, and playful collections. I am loving everything in the girls Samba collection! Thanks for this giveaway and chance to win! What a great company. The hard part would be deciding what to get... I like their boy separates. This clothing is adorable! I love that they do the collections. I'd choose the Virginia early spring daily tea collection, bright beautiful colors! The entire TEA collection is so cute - I love the boys clothes (hard to find cool stuff for boys!) and the Hasekura Graphic Tee is awesome. I love the adorable designs and it sounds like the clothes will last and last. Thanks for introducing me to this fun line of clothing! I'd love any of their daily tea dresses or rompers! They are so cute! Cara Blair: Hi, the Penelope 5-Piece Set is to die for! I love love love the colors! I would have to say the Santa Teresa Dress hands down!!! I would love it for both of my little girls. I love the daily tea especially the daily flounder collection! So cute! East Meets Brazil! My boys would look so stylish! i LOVE those little girl clothes!! they'd be perfect for my little girl!!! Oh I love this stuff. I had so much fun picking out my favorites. It would be a toss up. I would love to see my daughter (adopted from China) in the Daily Tea Multi Dot Banded Dress. But I also love the Mizumtos Stripe Dress and the Liberdade Plaid Dress. I'm ready to have a little boy any day now and started looking at the Layette things and I could just go on and on! Thanks for offering this! I love the Goncalo Polo adn the Sabastiao Trousers! Too Cute!! Super Giveaway! put me down for anything from the samba line. adorable stuff! 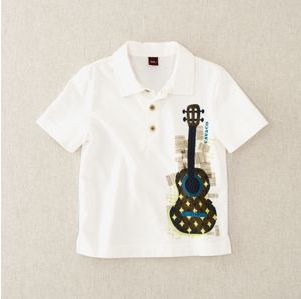 my little guy would be so stylin' in that guitar polo! I LOVE the Santa eresa Dress! So simple and so beautiful! Perfect for my baby girl! Thanks for introducing me to this line---I love it!!! I love them all how can you choose? Love the boys Samba collection and yet the little girls scream at me as well...great giveaway! I love their linen cotton roll up pants and their Goncalo Polo for the boys! Cute! Hi! My name is Heather and my daughter Isa and I love the Penelope set in the Daily Tea section. I love the east meets brazil mizumoto stripe dress. Gorgeous! But my little boy could use some spring clothes, too...Decisions, decisions! I LOVE this company! The item on my wish list is the Daily Tea Butterfly Sleeveless Banded Dress!! oh how i love tea's new line. i would love to win this giveaway to dress my little girlie. Wow! This these clothes are so adorable. I would have to say that I would for sure put the Daily Tea cherry blossom dress for my daughter and the Corcovado polo shirt. Hope I win! I love the Lapa and the Goncalo. My two year old's security blanket is a tea blanket and its his favorite thing in the world. The Santa Teresa Dress would be so perfect for my little girl. oh my I love them too. Raphael for my baby boy for sure. I would love to get the Santa Teresa! Both my girls would probably ask to wear them every day. Tea clothing is soooo great, I would love the Vine or Chrysanthemum drop waist dress for my little girl, but I would take anything from this company--I love their simple, beautiful designs! I am in love with that adorable Rio dress! How perfect for spring and summer! LOVE Tea! I'd splurge on a dress for my daughter, the Liberdad Plaid Dress, Mizumoto Stripe or a cotton playdress. And then some tees for my son. Adorable clothing! I would love the Samantha 6 piece set! What cute clothes! Oh, I'd love to get one of the Cariocas Shirts for each of my boys. They'd look so cute in them at church. I would love any of the adorable little dresses for my daughter! East Meets Brazil. I love Tea Collection too! Everything I have owned has worn so well and still looks new after many washings and wearings. oh man, I LOVE the east meets brazil line...I couldnt even choose, the little blue dress for girls is so cute, and the little hoodie for boys I LOVE! I would buy the whole design if I could! Oh lord! I NEED that liberdade plaid dress for Samme's 5th birthday.... love, love, love it! I love their new spring break daily tea clothes! I love the Samba style...especially the Gloria dress. I wish they had them in my size! Love the Daily Tea Floral Wrap Neck Dress. And love the whole east meets brazil line. I love the guitar t-shirt and the other retro boy shirts. Too cute! I'm so excited about this give away! I've been looking at the East meets Brazil and I love it! I'd love to win anything from the Tea Collection, but especially the new collection. Thanks for keeping such an awesome blog! Tea IS my favorite! I'm loving the Gancolo polo sweater and many, many others! It is so hard to decide! I love the wave polo in East Meets Brazil, but I also love the spotted frog polo in Spring Break. I would take the Parker 5-piece set or Grady 7-piece set. Those are both so cute and boyish. I would love to win. Thanks for the chance to do so. I love the Mizumoto Stripe Dress. Adorable. Ooohh I hope I win! I like the little citizens onesies! So cute and such a great cause! I love the Brasilia Crinkle Dress. BUt it's all so cute! I love the Daily Tea Polos! I would love the Eleanor 5 piece set for my friend who just had her first little girl. I just got there new catalog and have been drooling over it. I love Tea! I love every item I have ever bought of there's. I am loving the east meets brazil collection. I would get my girls matching dresses. Maybe the Cherry Blossom dress because that one is darling!! Any of those sweet dresses on my Miss P would make my day. How fun! Pick me! Pick me! I love Tea, and I've fallen head over heels for the Rio dress. My little girl would love to wear it! The Daily Tea Collection is adorable. I love the banded dresses. I would especially love the Eleanor 5 piece set for our new baby girl. So colorful and springy. What cute clothes! I love the rio dress. So cute! I love love love tea clothes. I'd love to have the Eleanor line for my little Eleanor! I think I'd pick up lapa polo shirts for each of my boys. I love the Sebastiano Striped shorts in large and the Corcovado shirt, also in large. I've been a fan of theTea Collection for a while now. It's so adorable! 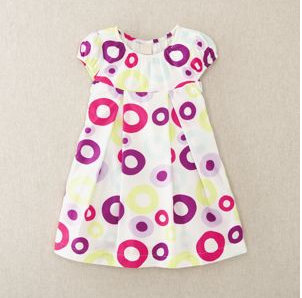 We love the last dress in this post--the one with the purple & pink circles. Love it, love it, love it! the drop waist dresses are adorable. i love the penelope 5 peice set. i think that's what would go in my cart. although i should probably get something for my boys, as well. i like the clement 6 peice set for our new baby, and for the older boys, i'd get some striped henley's and pullovers. what a fun site! thanks for the giveaway! WOW! What a great giveaway! Tea is such a wonderful line of clothes and I couldn't agree more about the quality. My little Ava sports the comfy clothes often! Thanks! Any of the dresses. ANY of them would be in my shopping bag with that gift card. I love Tea Collection clothes! The Daily tea Pinwheel and Butterfly shirts are just adorable and would look great on my little girl. Oooooh cute! I love the Kasato strip henley. I LOVE the Samba style! 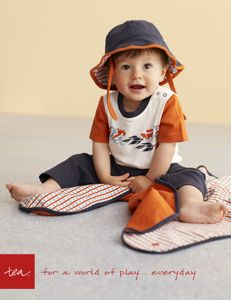 It makes me long for summer days :) My little mister would look SO cute in this collection. Ooh, love the dresses, especially the Mizumoto Stripe one. could the rio dress be any cuter?! Sign me up! I the Rio dress, Those circle dots get me every time! I just adore all their little dresses. I'd probably choose the Floral Wrap Neck dress and the Chrysanthemum Short Sleeve Banded Dress for my daughter. How fun! I love the Kiela 5 piece set, so fun for summertime. I got their spring catalog in the mail a couple weeks ago, and I have been drooling over it. I especially love the boy's stripe henley and the slub canvas shorts! My girls NEED those Rio dresses. LOVE!!! Cute and functional easter dresses. I don't know what it is, but I love hoodies for my boys. Love the seaglass hoodie. I would pick the Zaba Halter Dress and the Mizumoto Stripe Dress, so cute. I'd snap up some of those adorable polos for my little boy. Love them! The Ethel 3-piece set is super-cute. Would LOVE to see my little girl wear this outfit! My SIL introduced me to Tea. I would definitely put the girl rompers in my basket. The dresses are lovely and the mix and match sets are fun. If you want to simplify your child's wardrobe that is the way to go. Love their clothes! So many great clothes. My daughter would love to wear any of the dresses. What perfect outfits for an upcoming wedding!! I'd put the $75 toward the Liberdade dress, the Hokusai Waves shirt, and the Wave Long shorts. Stunning! i'd love to win. i browsed the boy section and love it all. My little munchkin would look amazing in the Tabitha set, with the dark pinks and oranges. Just perfect for her strawberry-brown hair! I love the Zaba Halter Dress from the Early Spring line. But then I also fell in love with the Mizumoto Stripe Dress from East Meets Brazil. A girl can never have to many dresses! My granddaughter would love all the pinks in the Daily Tea line. I liked the geo and chrysanthemum designs there. I love the Raphael set...totally would go in my cart. Tea is my favorite too! I LOVE the Samba Style line...all of it! I will narrow it down, though, to just the Copacabana Hooded Sweater. Love it! Hi! I came here through Metropolitan Mama. I have to say I hadn't been introduced to the Tea Collection before, and this is hitting me right as I'm starting spring shopping for all three of my kids, and I am just floored. I *love* these clothes! I want them all!! Ahh, but for the sake of the giveaway, I think my first choice would be Carter set for my almost 1-year-old son. After that I'd be going with the Jamie set (so colorful and lovely!) for my 5yo daughter. And then for my 3yo son... well, that's tough. I'd almost want to get him a matching Carter set to go with his little brother. ;) But at any rate, I *have* to bookmark this store, and see if I can swing the funds to splurge a little. Thanks!! Ooh, I would love the Sebastiao Stripe Shorts--perfect for summer! That is hard because it's all so cute.. My favorite is the Zaba Halter Dress I need one for both my girls.. I love the Keila set! I would love the Gloria top and Capri leggings in the Samba collection, and the Daily Tea Pinwheel Dress. This would all come in handy for Easter, 1st birthday and baptism trifecta scheduled for April! The Rio dress is so cute. But really, how can you pick just one? How impossible would it be to choose? I guess I would put it towards the Penelope set! I have a tea dress and leggings for my little one now and it is a favorite. We had her 6 month pics taken in it so we would always remember!! Ohhh! I love the "east meets brazil" collection! How cute is that Liberdade Plaid Dress? I'm crossing my fingers! Those dresses are adorable, particularly the Daily Tea Chrysanthemum Flutter Sleeve Dress - I want one in my size! I LOVE Tea Collection! I love the East meets Brazil line, especially the liberdade plaid dress and the Mukusou wrap cardigan. We are part Japanese, and Tea Collection really brings in the asian influence in their clothing in a very stylish, comfortable, and modern way! We would love to win!!!! I love the East Meets Brazil collection!!! Especially the Mizimoto Dress, Kasato Stripe Hooded Dress, Kasato Stripe Top and Gingko Leaf Top. I love the Daily Tea Collection too, but I love that the East Meets Brazil collection is unusual (and beautiful) styling for kid's clothes. Thanks for the chance to enter!! I love the Tabitha collection! I have no idea what I'd chooise, but something for a little boy! I would put the Daily Tea Solid Cargo Pant, Daily Tea Solid Long Sleeve Tee, Daily Tea Dahlia Tunic, Kiyoshi Legging, Junsui Floral Crop Jacket and Daily Tea Floral Wrap Neck Dress in my cart! My brand new niece needs every one of those dresses! - Lynne W.
Love the Brasilia Crinkle Dress!! It is darling! I am in love with the tea collection for my daughter but love the East meets Brazil for my son! I LOVE the tea collection! we have so many weddings and events this year, the Ginko Leaf Dress or Mizumoto Stripe Dress would be perfect for my 6 month old daughter! They are so sweet! I LOVE the Tea collection too for their style, quality, and comfort. If I won I would probably get the Cherry Blossom Dress & Bloomers set for my newborn girl and the Hokusai Waves Shirt for my 3 year old son. Oh what fabulous clothing...I think I would choose from East meets brazil. I love that line! I would love to win! I love the samba collection for both my baby boy and my toddler girl. So many cute things to choose from. I am bookmarking it right now. The Thomas 5-Piece set for my best friend's little boy would be going into my cart!! my daughter has never worn a tea outfit, but her cousin has and i admire her clothing every time we get together! i am a fan of the simple Carnaval Shirred Top--so cute! thanks! I love tea!!!! I want everything girlie! Tea is a favorite of mine, too! I'm lovin' the Taiyou Hoodie, Mizumoto Stripe Dress, and the Liberdade Plaid Dress. I love their clothes! I would have to get the Kristian Stripe Henley shirt, the Canvas Trousers, and the Shimo Wave Polo. They all look great! My son would look adorable in the Daily Tea Side Stripe Pants and Daily Tea Flounder shirt. But I have to say, I also am digging the DT Buzz Graphic Polo and the Lapa Polo shirt and Sebastiao Stripe shorts from the Samba style collection. Too many wonderful outfits! love all the fish and shark tees for boys... my sons love sharks! Yep... Tea is a fave at this house! I love the daily tea for my 7 month old. I would love to win some tea garb! Whoo hoo! oooh. me, me, me, I love tea! I would put the Santa Teresa Dress in my cart. I would love anything from the Samba line, but the Early spring line was beautiful, too. And I think I'd have to throw in one of those bug shirts in for my son. And of course, I'd have to hit the sale page! Puh-leese pick me! really like the samba style for boys! i love tea! best quality... ever! i would get the heitei pullover with the anchor, too cute for this spring. I love, love, love this line. I had a really hard time choosing between all of the collections. I really like the Ginglko Leaf Dress, Rio Dress, Brasilia Crinkle Dress, and Daily Tea Blossom Wrap Dress. I would love anything they are all so cute. My name is Mary Nies, and there are just so many things to want! I think I'd add into my cart the Cavaco Polo shirt for my son, and the Daily Pinwheel Flutter Sleeve Dress for my daughter. How wonderful it would be to win! Oh my goodness. I have a hand-me-down tea outfit that I LOVE, but I had no idea that every single one of their outfits was the cutest thing ever! I would go with the east meets brazil collection! I don't know if I like the Liberdade Plaid Dress or the Mizumoto Stripe Dress better! They're both insanely cute! It doesn't get much cuter than the Rio Dress. I LOVE LOVE LOVE the Daily Tea Pinwheel Short Sleeve Banded Dress, it is so stinking cute! Hello Tangled and True! It's Holly. Ever since I discovered the Tea collection I have been in love with the daily tea separates... they are sooo comfy and wear beautifully... Right now I am IN LOVE with the Kiela 5pc. set; it showcases my FAV fabrics: the pinwheel and chrysanthemum prints. Congrats on such a great giveaway! Hi, My name is Lena and I would LOVE to win either the Liberdade Plaid Dress or Mizumoto Stripe Dress from the East Meets Brazil collection which my little girl would look so adorable in. Or for my little man the Heitai Sweater Pullover or Waves Hooded Pullover from the East Meets Brazil collection. I love their new stuff and I love their clothes line, it's so different than the usual stuff that's in the stores and the quality is awesome. How exciting! This clothing line is so orignal and something I would definately put my baby in! If I won, I would most certainly put some pieces from the "east meets Brazil" collection. Particulary, the "Heitai Sweater Pullover." Such a unique nautical sweater!!! LOVE it! Tea fan here, too. I think I would pick that suave Lapa polo shirt with the slub canvas shorts. But, it would be a difficult choice, to be sure. I adore the Brasilia Crinkle Dress. They have such a great line of clothes for little ones. i love the samba line. the shorts are so cute and a little longer than most. love that! Hi...I Love the East meets Brazil collection and just hope to win so I can get the Izumi dress! 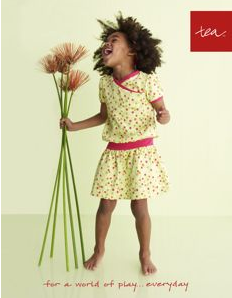 Oh...and I would also have to get the Daily Tea Tiny Vines Drop-Waist Dress for my girl! Thanks for showing this fun site! Everything is so cute it was hard to decide but i would put the Carmen 4-Piece Set in my cart for my 1 yr old daughter. Anything from east meets brazil would be perfect! Ohh, I would get the Mizumoto Stripe Dress and the Junsui Floral Crop Jacket(if I can pad it with my own money, of course!). Hi, my name is Sarah and I would LOVE the Brasilia Crinkle Dress for my red-haired, blue-eyed baby girl! I totally agree about Tea Collection - the best quality. And all the dresses become shirts over onesies + jeans in the winter! Love the new spring line. Our daughters would twirl for hours in the Santa Teresa and Rio Dresses. The Santa Teresa Dress is amazing!! I have to have that cavaco polo shirt also anything from the layette collection. So CUTE!! Oh my gosh, how can you choose? everything in the daily tea collection is absolutely gorgeous & would look soooo cute on my Izzie Grace!!! I love, love, love the Cavaco Polo Shirt! My little Oliver loves anything to do with music! anything from the samba style would look adorable for my little girl! I just recently found your blog, and had to enter this one!! I would scoop up the Dail Tea Pinwheel dress, and the Gingko Leaf dress form the East meets brazil collection.. I am so glad you told me about this clothing line, Thanks!! Jamie here. I love Tea brand clothes too! Everything I've ever bought, I've LOVED! 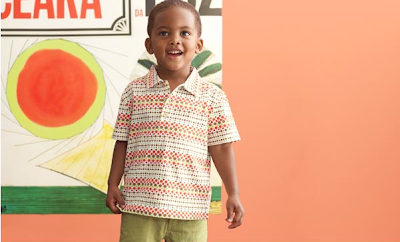 The whole Samba Style line for boys is the best, especially the Cariocus shirt. I'd love to get some spring clothes for my little boy! I love all the outfits! But i love the shirts from Daily Tea for boys. So Cute! the Sebastiao Stripe Trousers would be put in my cart. i can never ever have enough pairs of pants for my boys.... and of course the corcovado shirt, makes a nice combination, a good new sunday outfit. I love tea collection! Would get the penelope set! I LOVE the Cavaco Polo Shirt. Adorable. I can easily see my little man rockin' it! I love the RAPHAEL 4-PIECE collection from the Daily Tea. I love the orange and blue combo. So cute! I like the Daily Tea Floral Wrap Neck Dress. Ooooh ... Love the Daily Tea Chrysanthemum Wrap Tunic! I'm sure my daughter would give me lots of kisses if I presented her with this loveliness! I love the Parker 5-Piece Set. This would look so adorable on my son. Thanks so much. Santa Teresa Dress and the Jamie set. There is not enough cute boy stuff available but the Tea Collection is definitely one of the best. I love the striped Henley for my 3 year old and the hatsemura tee for my little. My name is Shannon and i would like the penelope 5 piece set. I love all of the Daily Tea, and I love the East Meets Brazil, it's too hard to decide! What a great giveaway! One can't go wrong with the hoodie dresss from the East Meets Brazil collection...too cute! And maybe I'd throw in some Daily Tea!